Pinterest is a great place for inspiration. 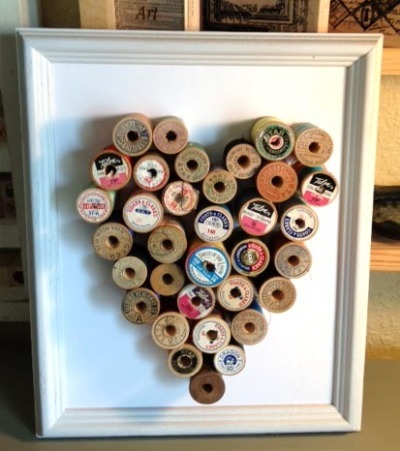 When I saw a heart made of vintage spools of thread, I knew it was a project that I had to do more than just pin! I knew I wanted it to fit in a standard 8 x10 frame so I started by cutting a piece of white card stock to 8 x 10. Then I found the center of the paper and made guidelines. 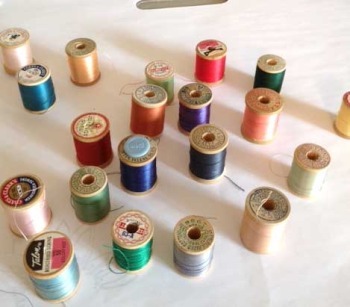 Then I sorted through my stash of vintage spools. I had gathered these from thrift stores for as little as 10 cents per spool. I prefer wooden spools with graphic, aged labels. I began positioning the spools on top of my guidelines. I filled the entire heart before I started gluing. Once I had them all in place, I began gluing them. I used a hot glue gun for quick drying time. A wet glue would give you more time to maneuver and reposition so you can choose which works best for you. I spray painted a thrift store frame white and adhered my cardstock to the frame backing. I used double stick photo tabs and lots of them. Here is Florida we have humidity issues with glue. After a few months your glue just unsticks and your project falls apart so I have to work around that. You do what works best in your climate. I decided at the last minute that this needed messy stitching to reflect my style. I pulled it out of the frame and stitched through the cardstock in a messy fashion with a varigated thread. Stitching around those dimensional spools was quite a challenge! If you want this look too - stitch on your cardstock as a first step! Now I have a cool art project for my wall.